Optimize Your Email Marketing For Mobile Now. How often do you access your email account using a smart-phone or other mobile device? If you’re anything like me, you’ll have become more and more reliant on your smart-phone for running your business. Email Marketing is a critical part of my business and it is now critically important that we take into account the changes in technology and its usage. Email Marketing statistics show it; growth. More and more people are reading their emails while “being mobile”. Even if being mobile means sitting on the couch watching TV. Mobile email has it’s own set of rules though. Your recipients interact differently with email on their mobile. The screen is smaller, the interface is different and many of them are touch-screen. So emailing for the mobile masses is a different ballgame. This is the easy one. You can simply choose not to optimize your email for mobile devices. As with any choice though, there should be a reason why. It might be that your audience opening on mobile isn’t large enough (yet) or that the added value of a changed and optimized design isn’t apparent. One of the more striking arguments would be, that it doesn’t have priority at this moment. Many email marketing programs have very big other fish to fry. Getting triggered email campaigns up, for instance. Marketers are busy, busy people. So by choice, is definitely understandable as long as it doesn’t wander off the radar completely. Because of the explosive growth, mobile email is a relatively new point of attention. So it is logical that a lot of marketers are still trying to find out how to actually optimize for mobile devices. 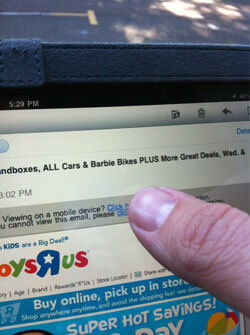 Displaying emails correctly is one thing, creating a mobile email strategy is another. The lack of experience might also be a part of it. Marketers just don’t know how to optimize for mobile devices yet. The answer? Get reading and talk to your Email service provider or other partners in crime you might have. Although general statistics seem impressive, the average doesn’t always apply. So you might want to check your own figures. Your message, brand, audience, type of emails, region, time and day sent, etc. They all have an influence on your own email marketing metrics. Be sure to check the statistics of your last few campaigns and see how many opens your mobile version got. But also be aware how to read and explain those mobile email statistics. In somewhat larger organisations, change doesn’t happen overnight. So mobile email is on the roadmap, but it just takes a while before it will get implemented. Plans and budgets were made at the beginning of the year or a redesign is already planned for in a few months. So we will see more mobile adapted email designs, probably also in b2b over the coming half year. It is one of these things that you should be asking your ESP about mobile email. So there are several categories and reasons why designs aren’t yet optimized for email on the mobile device. Luckily not all mobile email optimization requires a complete redesign. It is still a shame though, because until your messages are optimized, the added conversions isn’t adding up either.